A look at how the current top 20 prospects did today. Note that this list doesn’t include players currently in the majors. If a player is in the majors, he will be removed, everyone below him will be shifted up a spot, and a new player will be added to the bottom of the list. Rankings are from the mid-season rankings, and links on each name go to their Pirates Prospects player page. The 2013 Prospect Guide is now available, and is the perfect resource to follow the minor league system during the 2013 season. You can order your copy on the products page of the site. Order together with the 2013 Annual and save $5! Game Notes: Indianapolis won in classic fashion in the bottom of the 11th inning, getting the win on a walk off balk. Stolmy Pimentel bounced back from giving up seven runs in six innings last time out. He had some poor luck tonight, giving up just four hits and one walk in 6.1 innings, but allowing three earned runs to score. Two of the runs scored off Brooks Brown in the seventh inning after Pimentel left the game with two runners on. He threw 97 pitches, 53 strikes, and overall it was a much better outing than his last start. Game Notes: Ethan Hollingsworth made his first start back in Altoona since going to Indianapolis for two starts. Hollingsworth was hit hard tonight, giving up five earned runs after ten earned runs in his previous nine starts at the Double-A level. Justin Howard has a .406/.441/.625 line in 32 at-bats over his last ten games with Altoona, and a .333/.432/.444 line in 207 at-bats this year. Bradenton was cancelled due to rain. Game Notes: Check out John Dreker’s live game report. Game Notes: 2013 7th round pick Buddy Borden made his second pro appearance, throwing 1.2 shutout innings. In his two combined appearances he has thrown 2.2 shutout innings with a 5:2 K/BB ratio. Harold Ramirez picked up his fourth triple of the year. Jeff Roy stole his 22nd base of the year. 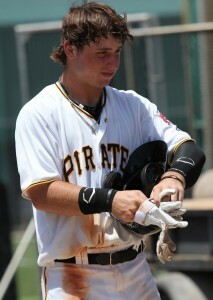 Adam Frazier extended his hitting streak to six games. Out of his 45 hits this year, 39 have been singles. Wyatt Mathisen picked up three hits in a rehab appearance in the GCL. Game Notes: Wyatt Mathisen had a great day at the plate in another rehab appearance. This is Mathisen’s third game. Each time he has caught, and each time he has played about four plate appearances. He has played every other game this week behind the plate. Reese McGuire stole his fourth base of the year. He has slumped at the plate so far this month, but he’s still hitting in the majority of his games, and his overall numbers are good. Wei-Chung Wang has three bad starts this year where he has given up three or more runs. His other six starts have seen zero or one runs allowed. Alex Dickerson has not played for a few games. Is he injured? You missed Hollingsworth having a couple of hits ! Of course the ” hits” were to H-Burg hitters,which led to a bench clearing fight in the 5th. Glad to see Mathisen healthy. Ah, yes the dreaded label, sorry for him. If only Justin Howard was a prospect…..